Mobile as well as a fixed crane operation is usually considered to be a daunting task. Recent reports, from labour departments around the country, have further verified that manoeuvring cranes can lead to serious injuries, and even death, if not undertaken by the experienced hands of a trained operator. Other than a responsible attitude, adequate crane safety training can go a long way in eliminating the hazards of crane operation. For this reason, a number of crane training institutes, which familiarise a potential operator in the security parameters of the profession, have appeared on the industrial topography of the nation. The core programme at these schools teach students about safe manoeuvring techniques; help them to understand standard hand and vocal signals of the job; acquaint them with the engineering principles of stable lifting; aid them to grasp the length and weight capacity of different cranes; and assist them to understand various pre-lift considerations as well as the complicated dynamics of making a load charts. 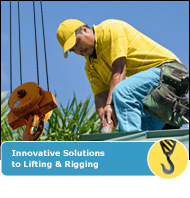 Want to know more information about crane safety training? These cranes are very powerful and you must have certified training when using them. Crane Institute of America will provide all these services for you. You can check out their website today at http://www.craneinstitute.com/.